When you need a fiber supplement or a laxative, Metamucil and Benefiber are two good choices. They're made from different ingredients, but both products consist of natural soluble fiber, which prevents or relieves constipation and may help lower cholesterol. While they're both safe, don't take Benefiber if you must avoid gluten, and be aware that Metamucil can cause an allergic reaction if you're sensitive to psyllium. The active ingredient in Benefiber is wheat dextrin -- fiber extracted from wheat starch. Metamucil is made from seeds of the psyllium plant. In spite of their different sources, wheat dextrin and psyllium are both soluble fibers. These fibers work naturally and they're the safest type of laxative, according to FamilyDoctor.org. As psyllium and wheat dextrin go through your digestive tract, they absorb water and expand, creating larger, softer stools. Bigger stools trigger muscles lining your intestine to contract, which helps keep stool moving through your intestines. The best way to prevent constipation is to get your recommended daily intake for fiber -- 25 grams for women and 38 grams for men -- from foods such as beans, whole grains, bran products, vegetables and fruits. However, psyllium and wheat dextrin supplements can help you fill the gap if your diet doesn't meet these goals. Depending on whether you use powder, wafers or tablets, Benefiber and Metamucil provide about 3 grams to 6 grams of fiber per serving. Don't consume more than is recommended on the package or use supplements to exceed your recommended daily intake of fiber, unless it's under your doctor's supervision. In addition to their laxative effect, the active ingredients in Metamucil and Benefiber may provide other health benefits. Soluble fiber is known for its ability to lower cholesterol, but psyllium has been studied more than wheat dextrin. 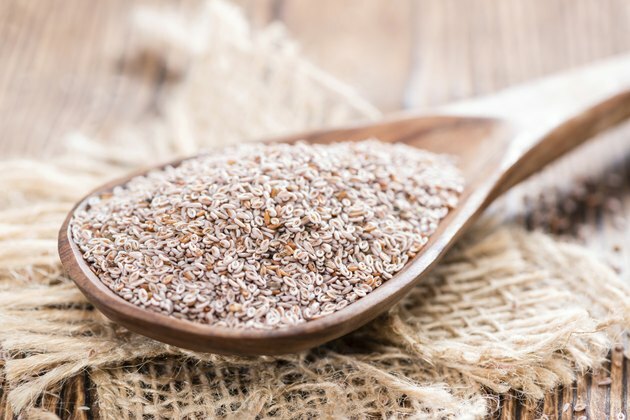 Psyllium is allowed to carry the same health claim as oats, stating that it may reduce your risk of heart disease when it's part of a low-fat diet. Both psyllium and wheat dextrin are fermented by the good bacteria in your large intestine, according to a study published in the "Journal of Medicinal Food" in August 2010. This fermentation produces short chain fatty acids that are absorbed and used for energy. Whether fiber comes from your diet or supplements, suddenly boosting your intake can cause gas, bloating and diarrhea. Add fiber gradually and drink plenty of fluids. Benefiber is well tolerated, but it is a wheat-based product and contains a very small amount of gluten, so do not take it if you have celiac disease or a gluten intolerance. Some people are sensitive to psyllium, in which case it can cause an allergic reaction. If you use the powder form, avoid inhaling psyllium dust. Stop taking laxatives and call your doctor if you have trouble swallowing, severe stomach pain, cramping, nausea, vomiting or constipation lasting longer than seven days.